When I was little I read a lot of fantasy. I loved when an author could build an entire world and then whisk me away to it in a way that felt so tangible, for a while I thought any closet in my house had the potential to lead me to Narnia. And I was devastated when the doors only ever yielded scratchy wool coats, boxes of musty cookbooks and moth balls. When I wasn't reading C.S. Lewis it was Lois Lowry's "The Giver" and Monica Furlong's "Juniper" and Elizabeth Winthrop's "The Castle in the Attic," Norman Juster's "The Phantom Tollbooth" and Madeleine L'engle's "A Wrinkle in Time." I'd get lost in these universes, take them back to the library and the check them out again -- my return ticket. Even now, 20 years later, I can still feel that childhood longing for a magical, other-world adventure. As an adult, I still read a lot of fiction. Although most of it is based in some version of our world, past or present. Other then "Harry Potter," my literary life has been devoid of the magic I craved as a kid. 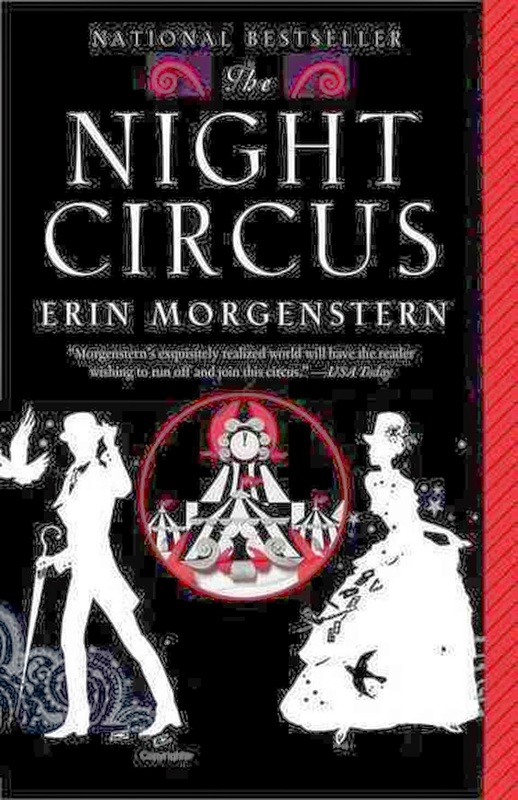 I just finished reading "The Night Circus" by Erin Morgernstern. I stayed up too late the other night to reach the end and was immediately sad that it was over. Like waking up from a wonderful dream. I building the world of a circus designed by magicians, Morgernstern transported me back to the stories of my childhood. One where reality is re-imagined, the colors are saturated (well, you know, except for in "The Giver") and the feeling that anything is possible. Quick summary: The story focuses on Le Cirque des Rêves, a circus that arrives without warning and is only open at … wait for it … night. The circus serves as the venue for a match between two magicians -- Celia and Marco -- who were raised for the sole purpose of competing in a game of their respective teachers' philosophies on magic (yeah … so … don't get too caught up in the details here … I think it's a battle between book smarts and inborn talent … but I'm not the smartest bruise on the knee, so don't quote me on that). Anyway, our two magicians fall in love with each other just in time to realize the whole terrible fate of the game they've been fated to play since they were children. I just read some reviews of the book, which came out in 2011. The New York Times was not as charmed as I was, nor were plenty of reviewers on Good Reads, but oh well. Perhaps it is too focused on spectacle and not enough on the question "Can children love who were never loved?" and maybe the central contest doesn't ever gain full steam. I don't really care, I was too awe of Morgernstern's imagination to feel the need to poke holes in her plotting. I could see her ship made of books floating on a sea of ink, the menagerie filled with paper animals and the garden made of ice. I could smell the bonfire, caramel and each of the scents in that tent full of containers. "Inside the train is opulent, gilded and warm. Most of the passenger cars are lined with thick patterned carpets, upholstered in velvets in burgundies and violets and creams, as though they have been dipped in a sunset hovering at twilight and holding on to the colors before they fade to midnight and stars." And for the child in me, that is enough. Morgernstern is self-conscious of the power of written word. Storytelling itself is the circus, and for someone who's not soon going to venture through a wardrobe or into the black and white striped tents that populate Le Cirque de Reves, it's a gift. "I find I think of myself not as a writer so much as someone who provides a gateway, a tangential route for readers to reach the circus. To visit the circus again, if only in their minds, when they are unable to attend it physically. I really it through printed words on crumpled newsprint, words that they can read again and again, returning to the circus whenever they wish, regardless of time of day or physical location. Transporting them at will. When put that way, it sounds rather like magic, doesn't it," one character muses. 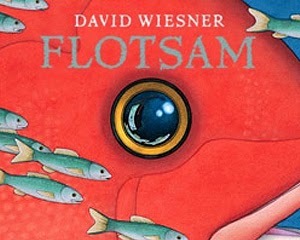 Because this sort of other worldly storytelling was such a huge part of my childhood, I was so pleased when, on a recent trip to the library, Lily pointed at the Caldecott Medal-winning "Flotsam" by David Wiesner and asked to bring it home. Again. "Look mom! It's the aquarium book! I want to get that one." "Flotsam" is the illustrated tale of a boy who finds a mysterious camera washed up on the beach he's been exploring. When he develops the film in the camera, he uncovers an entire underwater world unknown to the rest of us who know better. There are no words in the book, which is great for Lily, who turns the pages and narrates her own story. 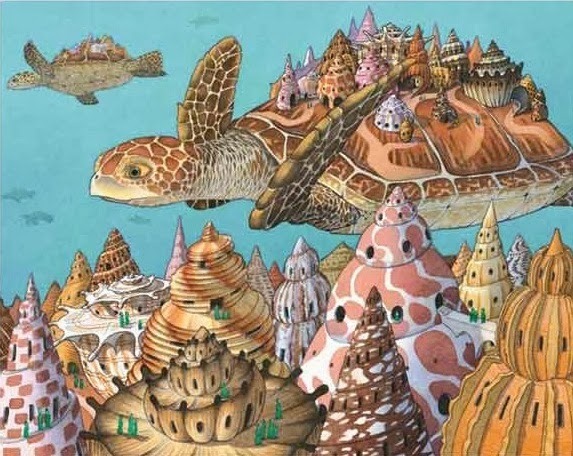 The illustrations are rich and gorgeous, begging to be studied. Of course I love that Lily and Jovie both love books. But to see Lily engaged in a book that challenges reality and introduces a sense of possibility and re-imagination of the world that we know, for a mother raised in other worlds, it's magic.